You are probably thinking, WHAT?!?! I promise, just continue reading and you’ll see how it relates to living with a chronic illness. The fable goes something like this- A farmer’s donkey fell down a well. The farmer considered what it would take to get the donkey out. He decided it would take too much effort and resources to rescue his donkey, and plus the donkey was very old. So he asked some of his neighbors to help him shovel dirt into the well to bury the donkey. I know, horrible times 1,000, right? The first few shovels of dirt were tossed down the well. Realizing what was happening, the donkey started neighing (or whatever sound a donkey makes) loudly and basically going berserk. Then after a while, the farmer noticed the donkey had become silent. He looked down the well and watched the shovels of dirt fall on top of the donkey. As each shovel landed on the donkeys back, the donkey would shake it off then stomp the dirt down under his feet. To the farmer’s astonishment, the donkey kept “shaking it off” and using the dirt to get closer to the top of the well. Eventually, the donkey made it to the top and simply walked out of the well. This post contains affiliate links. This just means that at no extra cost to you I receive a small commission if you purchase something through the links in this post. This is one of the ways I support my blog. Read my full disclosure policy. 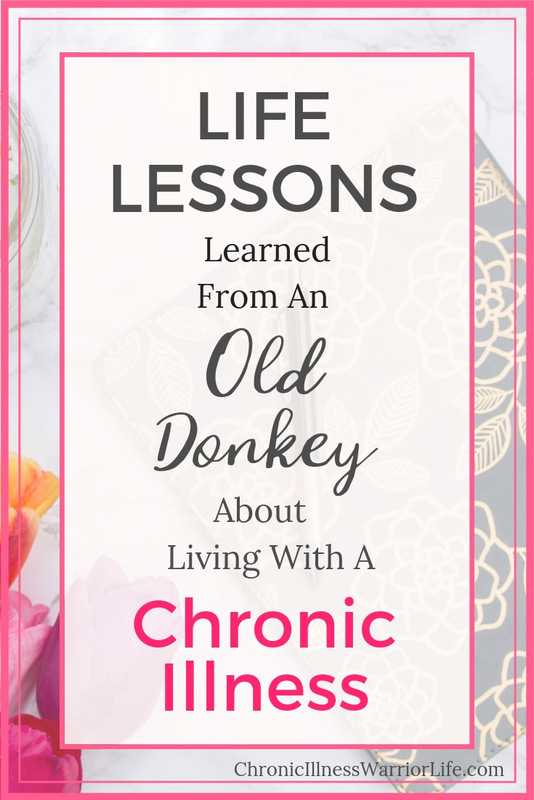 So What life lessons about living with a chronic illness did this donkey teach me? 1. Never Give up. Living with a chronic illness does not mean that we are doomed. The current state of our health does not mean it will never improve. Sometimes when we are first diagnosed, we won’t immediately find the right medicine or treatment. It has taken two years to find the right medicine to control my Rheumatoid Arthritis symptoms. There will always be new research and medications coming out that will positively affect the prognosis of living with a chronic illness. 2. Don’t live in reaction mode. Of course, when you first receive a diagnosis, you will react emotionally. That is natural. But continuing to live in “reaction mode” where all you do is live in the darkness of your chronic illness, is not the only option. It certainly isn’t the best option. You have to move on and go forth looking for ways to not just survive with your illness, but thrive. Thriving with your chronic illness is going to look different for each of us. When I first found out I was Bipolar, I was angry and felt like I would never have a “normal” life. I just felt broken and a burden to my loved ones. I have lived with mental illness (depression/generalized anxiety disorder) for most of my life, but now Bipolar decides to show up at the party? How unfair! But the more I asked my psychiatrist questions about what my long-term prognosis looks like, and the more I researched and learned about living with Bipolar disorder, I began to see I am not doomed to live in the shadows. I learned that I have to stay on my medication and continue to take care of myself both physically and emotionally. So no, I can’t be the star PTA volunteer and take on a whole bunch of responsibilities. I have to prioritize things like taking care of my 4 children and being a loving wife. I can’t allow myself to get sleep deprived and I have to pace myself when in engaging in things I am passionate about (like blogging). I am not going to lie, it took a lot to stop reacting. And being Bipolar there will be bumps in the road that put me back into reaction mode. But, I will just have to remember the lessons I learned from the donkey and refocus. 3. Find ways to be proactive in creating a good life even while living with a chronic illness. While I realize that we can’t just “shake it off” when it comes to the struggles and limitations we face living with a chronic illness, we can take them in stride and find ways to work through them. Like I said before, living in reaction mode does not put us in the right frame of mind to create a fulfilling life. That’s why being proactive is so important. The donkey realized that he could use the dirt shoveled on him as a stepping stone (pun intended) to save his life. We can “save our lives” from just existing and living in survival mode too. I’ve mentioned before that I also live in chronic pain. My formal diagnosis is CRPS (Complex Regional Pain Syndrome). I can’t stand or walk for more than 5 or 10 minutes without being in excruciating pain. There has been no treatment so far that has helped and there is no spinal surgery warranted. I am a candidate for a Spinal Stimulator, but we are fighting with our insurance company to approve it. I spent all of last summer in a “holding pattern” of staying home and avoiding moving around much because I was waiting to see if my insurance would approve the stimulator. Remember, I have four kiddos who were stuck at home too. With the start of the school year and no Spinal Stimulator on the docket, I decided I needed to be proactive and find a way to improve my circumstances the best way I could. So I figured out that I could use a recumbent stationary bike for exercising. I also decided I would stop binging on Netflix and venture out in doing things outside of my house. I want to challenge you to find your passion. Blogging has really been my savior these last couple of years since my RA, Bipolar, and CRPS diagnoses. It is something productive I can do while I am confined to my comfy recliner most of the day. 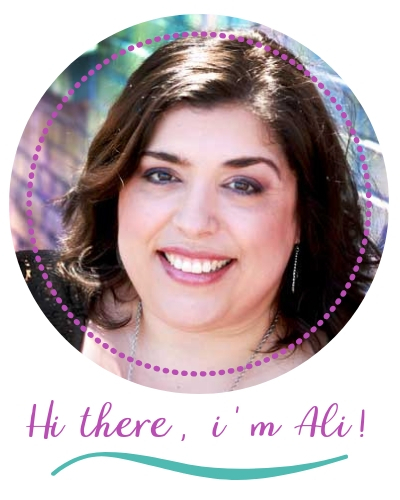 Blogging enables me to contribute to our family income and help others by sharing my experiences in learning to create a life I love despite my struggles in living with a chronic illness. You can read more about how blogging has changed my life here. Your passion does not have to create income. It can be volunteering for a cause that is dear to your heart or finding a hobby that brings you joy. I encourage you to take time and write down all of the things you love and brings you joy. There may be a dream you have always wanted to pursue or something new you would like to try. There is something in your heart, you may just have to dig deep down under all the negative feelings and emotions living with a chronic illness has created. This article was featured on The Mighty. Check it out here along with other inspirational articles about life lessons living with a chronic illness or mental health. P.S. Would you do me a favor and pin Lessons Learned from a Donkey about Living with a Chronic Illness? I appreciate it!